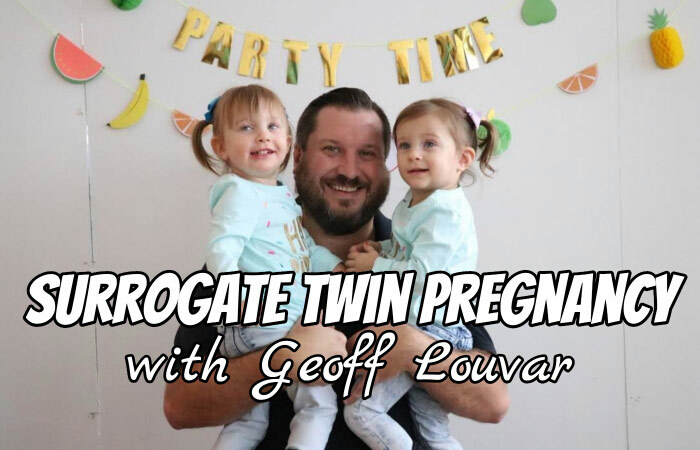 In this episode, we continue our Father of Twins Interview Series with Geoff Louvar, father of twin girls. Geoff’s wife’s book mentioned on the show: “Incredible You“. Joe: Hi, everybody. 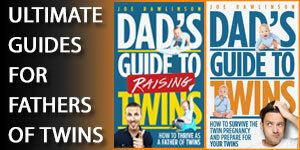 Welcome to the 171st episode of The Dad’s Guide to Twins Podcast. This is Joe Rawlinson. As always, you can find me on the web at twindadpodcast.com, where you’ll find the complete show notes and transcript for this episode and all previous podcast episodes. 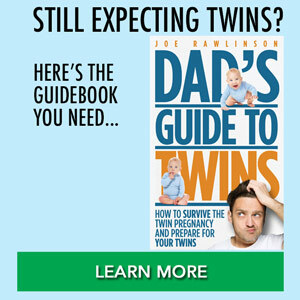 Joe: Today, we are continuing our father of twins interview series with fellow father of twins Geoff Louvar, who shares his amazing twin journey that involved surrogacy, failed in vitro rounds, and an extremely early delivery of twins. 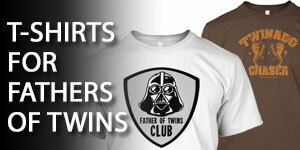 Joe: But before we jump into that story, I want to let you know that today’s show is brought to you by twintshirtcompany.com, where you’ll find dozens of t-shirts for parents of twins just like you. 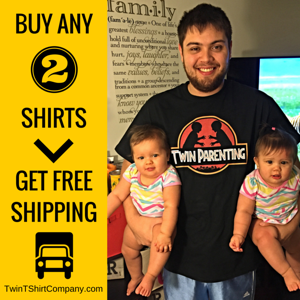 Head on over to twintshirtcompany.com. Joe: So, Geoff, tell us a little bit about your family situation before you started your twin journey. Geoff: Me and my wife got married in 2009. She has three kids from a previous marriage. She had benign tumors and had a partial hysterectomy. We knew we wanted to have a family. We just didn’t know if it was possible, so we looked into surrogacy. We didn’t have a family member to volunteer, so we to find someone. We actually put an ad on Craigslist, and I think it was titled “looking for womb to rent.” We got a couple responses and finally we met this couple, Melissa Little and Jeremy Little. It was just perfect. Her husband was a preacher and she just felt like she was called to do this. She’s a really giving person. Geoff: So, we started the IVF treatment. We had Griffin in 2011. I think we were pretty naïve to the whole IVF experience because it was so successful and it went so smooth. We waited a few years and started to try again. We had five failed IVF treatments, which was kind of a rollercoaster because all the shots involved that Melissa and my wife had to take and the waiting period of two weeks to see if the transfer actually took, it was pretty depressing until we found out we were pregnant with the twins. Joe: What duration of time did that take between your first one and when you finally were successful? Geoff: Four years. Yeah, and during this period, Melissa actually moved from Wichita to Oklahoma, so that was kind of difficult because she was having to travel back and forth for all the appointments, so it was a pretty rough four-year journey. Joe: Had she been a surrogate before? Geoff: No, she had not. Joe: Okay, so the first pregnancy went very well, it sounds like. Geoff: Yeah. We didn’t have any problems. I guess we thought it’d be easy going from that point. The financial difficulty of each cycle, it’s a lot of money. I guess our spirits just got down each time, but I think I was pretty determined, like, “Okay, this is going to work.” Our son Griffin kept on saying, “I want to be a big brother.” When we found out we were pregnant, he was like, “We’re having twins,” so we thought that was kind of clairvoyant, I guess, that he knew we were having twins. Joe: So, you were determined to see this through, until you actually had another child, at least one more. How did you keep your surrogate engaged through this four-year journey? Geoff: We’re very close with her. Her and my wife talk every day. I think she really wanted Griffin to be a big brother too. I think we just had faith that it would work eventually. I think the last time we did it, though, we were like, “Okay, this is the last time we’re doing this.” We didn’t tell anybody. The previous attempts, we told everybody and everybody was like, you know, “We’re praying for you.” The last time, we were just like, “We’re just not going to tell anybody. We’re not going to put everybody through this,” because the whole wait, it’s pretty brutal. It takes a lot out of you, and especially when it’s not successful. Joe: Did you have to pay your surrogate? Was it per pregnancy, IVF round, or some other arrangement? Geoff: Yes, we did pay Melissa (our surrogate) and lawyers for each contract that had to be written for each IVF attempt. Surrogacy contracts are pretty detailed for every possible outcome and situation. They are contingent contracts that start with each cycle (when she started to take injections and going to doctor appointments). A larger payment was made after each transfer. When it resulted in a confirmed pregnancy the monthly payments begin. The contract also included maternity clothes allowance, travel pay, and life insurance. The payment amounts increased since we had multiple babies and by c-section. And since she was on bed rest we had to pay for income lost for her being away from her job. A larger amount is paid after delivery. To Melissa, it was never about the money. Our families became so close, and she is such a giving person that she had offered to carry for us free. But we wouldn’t let her because we didn’t feel that it was right. She devoted so much of her time and went through so much pain and heartache for us during a 5 year period that we feel like there is no way we could ever pay her back. Joe: How were you able to handle the finances of this? Did you have insurance or did you just have to pay out-of-pocket? Geoff: It was all out-of-pocket, so I had to take a second mortgage for one attempt. I had to get a couple credit cards. I had to get loans on our cars, which I think that added to the whole stress of it. Joe: Yeah, it sounds like you were all in there. So, at the fifth round and it finally took, when did you get the first hint that it was going to be different than the previous ones that had failed? Geoff: Melissa, she went to get tested for her numbers and it was a positive pregnancy. Then she went back, I believe it’s like every two days, to check her numbers. They’re supposed to double, but they started to quadruple. They just got higher and higher. At one point, we thought we might have four or six babies. We were all kind of freaking out until the ultrasound, realizing there’s just two in there. That was a relief. Geoff: Due to all the failed attempts, we were pretty excited to have twins, just because we had spent so much money and we were like, “Okay, now we get two babies.” We were pretty excited. We really didn’t know the road that was ahead of us. Joe: How was the twin pregnancy going before you started to get surprises? Geoff: Everything was going great. We had just found out the gender. We found out we were having two girls, which for some reason we thought we were having a boy and a girl, because that’s what Griffin thought we were going to have. We had our names picked out for either two boys or a boy and a girl. We had no idea what names for two girls. Griffin was pretty sad because he wanted a little brother. I went through the whole shock of I’m going to have to raise two little girls. That’s two weddings to pay for. That’s two broken hearts I’m going to have to mend. I think just raising boys is different than girls, so I was pretty scared. Also, having twins too, I was kind of scared of if I would love them equally or if I would love more than the other. That was kind of a thing that I was debating in my head, like how is this going to work out? Geoff: During that time, they gave us a tour of the NICU, which I had no idea what a NICU was. I mean, I knew about premature babies. I just had no idea what everything looked like. So, me and my wife took the tour. We were pretty shocked and really scared, just to see all these little babies that … They’re just so small. I can’t describe how small they are and hooked up to tubes and their little … their plastic incubators. It’s was a lot to take in. Geoff: What was difficult too was, I guess, the guilt of Melissa being on bedrest and away from her family back in Oklahoma. That was really tough to handle because we knew that she was most likely going to miss Thanksgiving and Christmas while she was in the hospital. I just felt really awful that Jeremy was having to take care of his kids is Oklahoma by himself, and the kids, they don’t have their mom. It was really difficult. Geoff: She was on bedrest for about two weeks before she was bleeding really bad, then the doctor’s like, “We have to take them.” They were born at 26 weeks and four days. Joe: So, tell us about that experience, when you found out that today was the day that you were going to have the twins. Joe: Were you able to be in for the delivery of the girls? Geoff: I was not. My wife was because only one person could be in there, so my wife was with Melissa. I got to see them take the babies from the hallway to the NICU, which I just couldn’t believe how small they were. Joe: How small were they compared to maybe your hand? Geoff: They were born at about two pounds. I could put my wedding ring through their arms. They were just so small. I could hold them in my hand. It’s different because Griffin was a full pregnancy. You get to hold him right away. He has meat to his bones. He’s chunky. These girls were just so skinny. You could see their ribs and their skin is so different, like it’s not really fully developed. It’s kind of sticky and so delicate. You’re not allowed to touch them for a while. I think it was maybe two weeks before we could hold them and do skin-to-skin. Geoff: Driving back and forth between home life and the NICU. The older kids, we felt like we were neglecting them because we were spending so much time at the hospital. I think it was just a lot of guilt of we tried so hard to have these babies and now everybody else is getting ignored. Joe: How were you able to manage Griffin and home life and maintain that schedule during that time in the NICU? Geoff: My wife would go to … She actually took her maternity leave from the bank to be with the girls while they were in the NICU. My work was pretty accommodating. They knew the whole situation, so I would just go in for a few hours in the morning at work, and then I would drive up to the NICU. Usually me and my wife would have a few minutes to have lunch, and then she would come back home and take care of the older kids while I was with the girls. Around dinner time, we would switch back where I would come home and then my wife would go back up to the hospital. Then we would get the kids to bed, then we would switch again and then I would spend until the later part of the night with the twins in the NICU, then we would get a few hours of sleep. This cycle just went over and over again. Geoff: Me and my wife didn’t really spend a whole lot of time together, just through passing, basically. Just the stress of it, we were just tired, but you’re on autopilot, so you’re kind of outside of your body, just doing whatever you can just to get through the next day. Joe: What were some of the milestones that your girls hit in the NICU that gave you the light at the end of the tunnel? Geoff: Jordan, the older twin, she was on oxygen up until about five days until she came home. I guess the big milestone is when London, the younger one, opened her eyes after … I want to say three weeks, because her eyes were still closed. We had a couple scares. London was bleeding in her intestines, and that was pretty scary. Joe: What did the doctors have to do for that? Geoff: They really didn’t know what the cause was for it. She just kind of fixed herself. I really think prayer helped. They don’t know why she got better, but she did. Jordan, they thought that she was going to have to have surgery because she had hernia, but that went away too. There was a couple times that they had to have IVs inserted in their head, which is pretty scary just because of dehydration and their other veins weren’t big enough to put the IV in. Geoff: Also, trying to teach the babies how to drink milk was a really difficult and frustrating experience because they just had to drink two ounces of milk and it took like a month-and-a-half for them to figure it out. That’s what we were waiting on to come home. We were at the NICU for like 95 days. Joe: How were you involved in that feeding process? Geoff: The nurses would teach us how to do it. They would encourage us to try to do it ourselves, so we would just watch the first couple of days and then we would try to do it. NICU babies are on such a schedule. In the hospital, they were on two-hour feedings. It would take about an hour for them to eat and they would fall asleep, and then you would start on the next baby. It was just like that around the clock. Joe: So, after the 95 days, were they able to come home together? Geoff: One came home a day before the other, which was kind of funny because that’s the goal and that’s the moment you’re looking forward to, is finally bringing the home. So, we brought London home. The next day, we took her back up to the NICU to spend time with Jordan, and then that day, they were like, “We’re going to release Jordan too,” so we got to bring them both home together the next day. Geoff: That’s really when the next journey started because we didn’t know how difficult it was bringing them both home. That was the goal, like finally we’re all going to be home as a family. There’s no driving back and forth. We can spend time with the older kids. I don’t think anybody can prepare you for when you bring them home because you’re so used to depending on the nurses and the doctors and the monitors. You actually get the chance to go home and sleep, where when you’re home, it’s all on your own. Geoff: Since they were preemies, we were on a three-month quarantine where we weren’t allowed to take them outside. Nobody outside the family could come in or out, so the older kids were kind of disappointed because they couldn’t have friends over. All family members like my parents or my in-laws had to wash their hands, take off their shoes, just making sure the girls didn’t get sick. If the older kids got sick, we had to put them in the basement and be like, “You can’t come upstairs.” That’s where really you felt like you’re in a bubble and isolation and totally out of touch with society because you’re just stuck in the house. 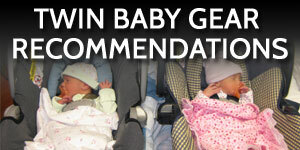 You’re sleep-deprived, you’re only taking care of babies. It was just a really difficult time. Joe: How about your work situation? Did you have to go back to work right away? Geoff: During the time that they were in the NICU, I lost my job because I wasn’t able to work as much as they needed me to. At that point, I decided, or we decided, that I was going to be a stay-at-home dad, just because the cost of hiring a nanny was going to be so expensive, and they were so difficult to take care of. We really didn’t trust anybody that could take care of them, so I became a stay-at-home dad and my wife was working part-time. Joe: About how many months did it take for you to think, “Okay, you know, I think we finally got this,” you had a good routine, you were able to get out of the house, and things were going a little more smoothly? Joe: It’s amazing how much time it takes to get out of the house. Joe: How old are they now? Geoff: Two years and four months. Joe: Oh, yes. You’re right in the middle of it right now. Extremely mobile, extremely curious, into everything. Geoff: I just really didn’t understand why I wasn’t happy because this was … What I was determined to have was these little babies and they’re healthy and I have a great wife and I have great kids. I just didn’t understand why I wasn’t happy. I think it was just the perfect storm of losing my job and being a stay-at-home dad and the isolation. You’re just living hour-to-hour. They were colicky babies. Geoff: I was watching the show “OutDaughtered” and the dad on that show, Adam Busby, he kind of went through this depression. I was like, “Okay, well, maybe this is normal,” and I started reading about it. I decided to go to the doctor at the encouragement of my wife, and he prescribed some antidepressants and anxiety medicine. It was kind of a life-changing moment of … It wasn’t as bad as I thought it was. I was happier. Since then, it’s just been great. I just encourage other dads that are depressed after it, you’re not going to understand why it’s going on, but to get help and there’s nothing to be embarrassed about. Joe: We think it may be something that would happen to mom but not to us, and yet it’s a very real thing, so I’m glad you’re able to get the help you need. It’s a good reminder for other dads listening. Geoff: That was another thing, was the colicky part and the vomiting. We probably went through, I want to say, like six months of both of them just extreme crying from, we would call it “the witching hour,” from about seven o’clock at night to almost midnight, where they would just cry uncontrollably. You think they would wear themselves out because they would be crying so hard, they would vomit. Tears would be running down their face and they would be choking because they’re crying so much. We tried everything. We tried lavender. We tried singing to them. We tried making the house really dark. We tried warming up the rice pads to settle their tummy. Nothing worked until finally they just grew out of it. Joe: Now that your girls are about a little over two, what’s the typical schedule like? Geoff: They get up about 6:45 or 7:00 AM. Recently, we just stopped giving them bottles of milk, which we would, at the time, give them a bottle of milk and change them and get them out of their pajamas. But now that they’re no longer on milk, they want cereal, so they start point to the pantry where we keep the cereal. They go grab their iPads and we make cereal and they sit up at the table, eat their cereal, and then they say they want down. They’ll play for a little bit. Sometimes they take turns wanting held, like they’ll just crawl up on the couch or the chair I’m sitting on and we’ll kind of watch TV together. Then they’ll play some more, then it’s lunchtime. Feed them lunch. By that time, they’re ready for their naps. We put them down for sometimes a two or three hour nap. They get up, play some more, eat dinner. Now that the weather’s nice, we try to take them to the playground or go on a walk, trying to kind of wear them out. Geoff: About 8:00 PM, it’s bedtime. We’ll give them a bath. They brush their teeth. We get them pajamaed. We kind of hold them, cuddle them for 30 minutes, then we put them in bed. Then it’s kind of a big relief. Everybody can kind of relax. Then it starts all over again. Geoff: We’re getting to the point where they’re crawling into each other’s cribs, so we had to get another monitor to start watching them. It’s kind of fun to watch them throw their pillows and blankets into one crib and they kind of play with each other until they fall asleep for their naps. 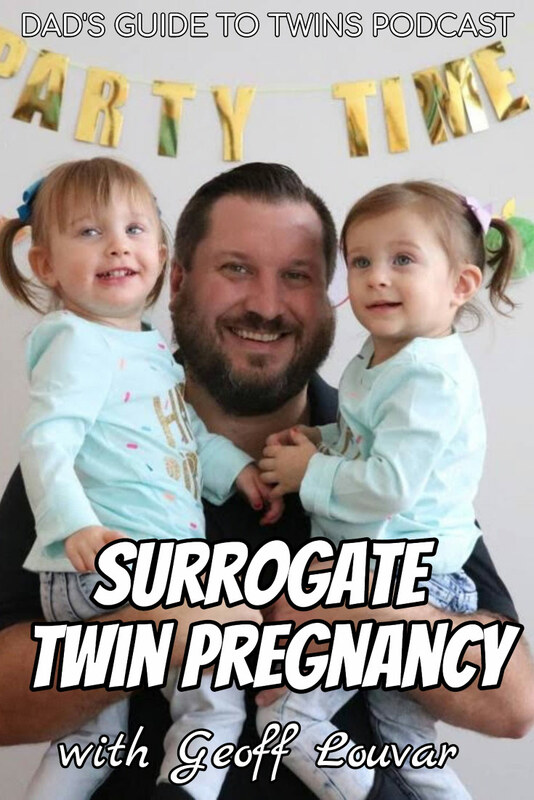 Joe: What’s been your ongoing relationship with the surrogate mother now that your twins are older? Geoff: She’s great. We talk to her on social media. Her and my wife, they text each other every day. She tries to make it up every few months. She’s great about coming to all the kids’ birthdays. She’s just amazing. She writes all the kids a letter every year that they’re not supposed to open until their 18th birthday. We’re very open about it. My wife actually wrote a book about surrogacy and how Griffin was born. Joe: What’s the name of the book? Geoff: It’s called “Incredible You.” It’s available on Amazon. One of her friends illustrated it and we got it published. It’s just the journey of being born through a surrogate. Joe: That’s great. I’ll link up to that in the show notes for the podcast today so people can check that out. Joe: So, Geoff, as we wrap up today, if folks do want to connect with you, what’s the best way to get in touch? Joe: Yeah, we are an elite club of twin parents. Joe: Well, Geoff, thank you so much for sharing your story with us today. We really appreciate it. Geoff: All right. Thank you so much. Joe: I hope you enjoyed that conversation with Geoff about his twin journey, the amazing ups and downs that his family went through to bring these twins into the world and the challenges that they’ve had in the last couple of years raising them. 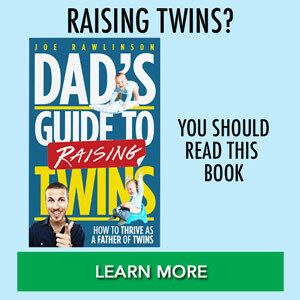 If you want to connect with Geoff, I’ll link up to the social media links and his wife’s book over at twindadpodcast.com. Joe: If you’ve enjoyed our father of twins interview series and you would like to share your twin story on the podcast, go ahead and reach out to me: [email protected], and we’ll make it happen.